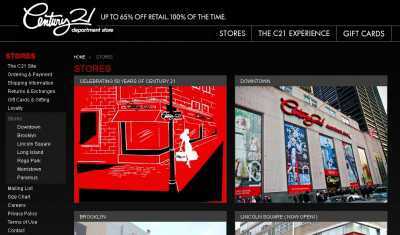 C21Stores.com was launched by Century 21 in 2004, to give people who enjoy shopping at any of its seven department stores yet another option when it comes to buying fashionable clothes and accessories. As I’m sure you know, Century 21 is a company that strives to make high fashion affordable. It was founded more than 50 years ago, and it has always prided itself in offering discounts of at least 65% on clothes and accessories designed by the most prestigious fashion brands in the world. Well, on C21Stores.com just anybody can shop for such items. These can be browsed by category, and a sizing chart is provided for you to ensure that you’re not making the mistake of buying ill-fitting clothes, and having to return them afterwards. Orders are placed using a straightforward cart system, and you can pay for what you’ve bought using either your credit card or PayPal. And then, by signing in to your Century 21 account you’ll be able to track your order once it has been shipped. And on C21Stores.com you can also buy gift cards, and have them delivered to whomever you want. Century 21 gift cards never expire, and they are available in the following denominations: $25, $50, $100, $250 and $500.